Reviewed by Nada Basheer, an avid non-fiction reader and reviewer, a long-time Michael Jackson fan and student. She blogs at http://missoverloved.blogspot.ae/ and tweets @overloved. Basheer, Nada. 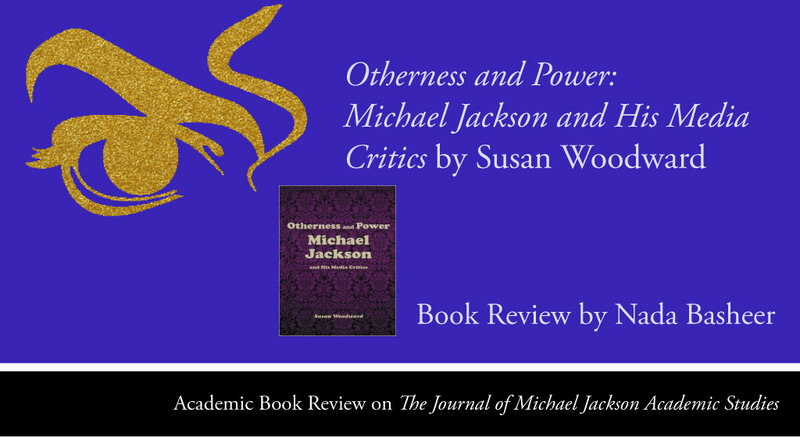 “Academic Book Review of ‘Otherness and Power: Michael Jackson and His Media Critics’ by Susan Woodward.” The Journal of Michael Jackson Academic Studies 3, no. 3 (2016). Published electronically 28/12/16. http://michaeljacksonstudies.org/academic-book-review-otherness-and-power-michael-jackson-and-his-media-critics-by-susan-woodward/. Michael Jackson was just two months shy of his 51st birthday — and had been preparing for his comeback tour, This Is It when his sudden death shook the world. For all his many millions of fans, which he accrued during the span of a remarkable four-decade musical career, Jackson is largely viewed as a saintly figure and as an exceptional artist and producer. He was characterized by people who associated with him as a genuinely down-to-earth person. Those who knew him spoke highly of his compassion and kindness. However, the media regularly painted a totally different picture of Jackson. In this innovative analysis of Michael Jackson’s cultural impact; Susan Woodward puts Jackson’s most hostile critics under the microscope and examines the origins and psychological basis of how such extreme malicious attitudes come about. In an attempt to unmask the media’s misrepresentation of Jackson, their vicious criticism — which could easily be viewed as a caricature — and the severe damage they did to him. The book focuses on three examples of writing in which the recognition of Jackson’s power, and the unsettle that it caused, is unequivocal. Woodward explores in depth how Jackson’s power was seen and the unconscious response to this exceptional power that went beyond affluence and fame. The author moves on to analyze in ‘Chapter Three: Web of Fear’ an article about Michael Jackson entitled ‘Losing His Grip’ by journalist Maureen Orth that was published in Vanity Fair Magazine in 2003. Woodward asserts, ‘unlike Dave Marsh, Orth gives no sign that she had any appreciation of Jackson’s talent or that she was ever sympathetic to him.’ But the author clarifies that although Orth, just like Marsh, perceives Jackson in terms of power and otherness, ‘but she fears his power and feels that he uses it to manipulate and harm others.’ Chapter Two gives the readers a closer look into Orth’s informants and the background of her article. Woodward reflects, ‘was bullying of Jackson by the media effective? Did the years of rumors and falsehoods about Jackson damage him in any substantive way?’ A question which she gives a detailed answer to before ending this chapter. The last work that Woodward expounds in ‘Chapter Four: Angelism and Beastialism’ is The Resistible Demise of Michael Jackson, which consists of a collection of essays written by 23 academics, music writers, and bloggers, edited by Mark Fisher and was published in 2009. Although Woodward does not hesitate to describe it as, ‘a fairly useless book.’ Due to the lack of factual reliability, as the author states. She goes on to explain, ‘it can also be seen as a Rorschach test of attitudes toward Jackson, a free association that produces unconscious views along with the conscious. Therein lies its value as a work to be analyzed.’ Woodward further investigates long lists of terminology that show these writers’ perception of Jackson as powerful. She observes that in spite of the authors dreadful representation of Jackson, ‘there is simultaneously something else of a completely different nature going on in their writing.’ She reveals that the authors continually used terminology that described Jackson’s talents in ardent expressions which portray Jackson ‘as having a power of a king or sometimes a despot and, most surprising and most frequently, that represent him as a divine or supernatural figure.’ But did Jackson intentionally aim to be perceived this way? Although it is distressing to read the demeaning and hateful descriptions of Jackson by many of his critics (or shall we say adversaries? ), Woodward debunks and exposes their hidden fear and their bewilderment by his extreme power and as the author coins-his extraordinary otherness. ‘It is remarkable, however, that after decades of hostile, inaccurate coverage by the media, the image of Jackson as a powerful, ‘angelic’ being survived. While one would expect such a view of Jackson from his fans, it is surprising to find such strong evidence of it in the writings of his critics,’ acknowledges Woodward. Woodward’s book is an excellent and a thorough analysis, which leaves the readers with a different insight into what signifies Michael Jackson more than any other popular culture figure. The writing style is thought-provoking and eloquent. It is an essential read for journalism students and for those who are studying or interested in History & Criticism or simply looking to understand the cultural influence of Michael Jackson and his indisputable power. Also, it is a suitable read for those who have read Harriet Manning’s Michael Jackson and the Blackface Mask and Joe Vogel’s Featuring Michael Jackson. Read our wonderful interview with Susan Woodward by The Journal of Michael Jackson Academic Studies here. Where to buy: Otherness and Power: Michael Jackson and His Media Critics by Susan Woodward: Amazon UK and Amazon USA. Susan Woodward is the author of Otherness and Power: Michael Jackson and His Media Critics (2014). A licensed clinical social worker, she holds a master’s degree in social work, and has training as a psychotherapist. She currently works in (legal) public defense, and her clients are mostly adolescents, who have cases in family court. Find out more about Susan’s work via Amazon UK and Amazon USA. Nada Basheer is an avid non-fiction reader and reviewer, a long-time Michael Jackson fan and student. She runs a successful blog, filled with fantastic insights and remarkable detail on her reading at Overloved and tweets prolifically at @overloved. Her work for The Journal of Michael Jackson Academic Studies, includes an academic review of ‘Keep Moving: The Michael Jackson Chronicles’. Find out more about Nada here.